Liberty Storage Solutions opens up another season in the production of single car garages in the Triad of North Carolina. A family-owned business since 2004, this manufacturer provides various types of single car garages to the people of Greensboro, Winston-Salem and High Point and their surrounding areas. Spring has come and the time to think of doing things out of doors is here. Liberty Storage Solutions is pleased to introduce their Spring Discounts on single car garages in NC. As many are feeling the crunch of what our economy, Liberty Storage Solutions is offering the best prices of the year in order to make their one car garages available to more car garage shoppers throughout North Carolina. Bobby Eaton, owner and manager of Liberty Storage Solutions has announced that the current prefab car garage discounts are effective through the end of April. The first discounted prefab car garage sale consists of a 5% discount on the purchase of any product in their variety of vinyl or metal one car garages. These single car garages come in a range of colors of vinyl and metal as well as roofing shingles as well as an option for a loft for extra storage. Lofts are a great place for keeping things off the garage floor and leaving the space free for the car, motorcycle or lawnmower. The make the prefab car garage deal even better, Liberty Storage Solutions will include a free ramp on any new vinyl, wood or metal car garage ordered during the month of April. This specially built one car garage ramp is valued at $300.00. Bobby Eaton, owner of this one car garage company says the free ramp will be included with any purchase or rental of a new prefab one car garage before April 30, 2012. 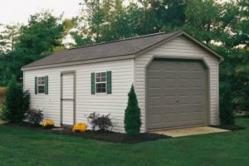 Liberty Storage Shed is also offering great deals on their rental 1 car garage line. Until the end of April any rental of a new prefab car garage can be secured with only one month rental security deposit. That is half of the normal payment of two months. For the equivalent of only one months rent a car garage can be delivered and installed on one's personal property. Now, rather than renting a garage storage unit across town and wasting precious petrol dollars to get back and forth, there is the option of a car garage rental unit at ones home or business. The Rent-to-Own Garage deal also includes a one car garage ramp at no extra charge, also valued at $300. The advantage of acquiring a garage on a rent-to-own basis is that If one would ultimately like to own a prefab shed garage, all that is necessary is make the rental payments for 36 months. At the end of three years, the building is solely the property of the renter. Otherwise, if the vinyl single car garage, metal one car garage, backyard shed or metal building is only needed temporarily, Liberty Storage Solutions will take it back at any time, and payments will end for the renter. Also, at anytime in the course of the rental period, one may obtain ownership of the garage for 60% of the remaining balance of the rental agreement. Liberty Storage Solutions is also proud to announce the opening of a new location from which it is making available it’s one car garages in North Carolina. This outlet is located in Statesville, NC and is also in the Triad of North Carolina. They have lately been stocking this Statesville location with not only single car garages, but also storage sheds, gazebos and swing-sets. Built on a tradition of quality, integrity and beauty in the NC one car garage industry, Liberty Storage Solutions continues to widen their sphere of business to an ever greater area of business in the north central region of North Carolina. In a time when the economy of the U.S. is in the condition it is, values displayed by car garage manufacturers like Liberty Storage Solutions are a great advantage to those needing an extra place to store their car, truck or boat. To make their products more accessible to prefab car garage shoppers in North Carolina, Liberty Storage Solutions is now selling these sturdy and attractive single car garages from the three locations in North Carolina, Salisbury, Cleveland and Statesville.